Marshal test is extensively used in routine test programs for the paving jobs. 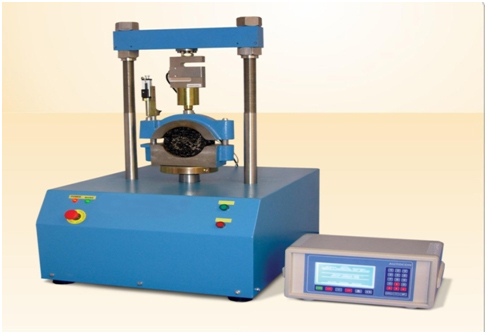 The stability of the mix is defined as a maximum load carried by a compacted specimen at a standard test temperature of 600 °C. The flow is measured as the deformation in units of 0.25 mm between no load and maximum load carried by the specimen during stability test (flow value may also be measured by deformation units of 0.1 mm). This test attempts to get the optimum binder content for the aggregate mix type and traffic intensity. This is the test which helps us to draw Marshall Stability vs. % bitumen. Specimen mould assembly comprising mould cylinders 10.16 cm diameter by 6.35 cm height, base plate and extension collars. Specimen extractor for extracting the compacted specimen from the mold. A suitable bar is required to transfer load from the extension collar to the upper proving ring attachment while extracting the specimen. Compaction hammer having a flat circular tamping face 4.5 kg sliding weight constructed to provide a free fall of 45 cm. Compaction pedestal consisting of a 20 × 20 × 45 cm wooden block capped with 30 × 30 × 2.5 cm MS plate to hold the mould assembly in position during compaction. Mold holder is provided consisting of spring tension device designed to hold compaction mould in place on compaction pedestal. Breaking head: this consists of upper and lower cylindrical segments or test heads having a inside radius curvature of 5 cm. the longer segment is mounted on a base having two perpendicular guide rods which facilitate insertion in the holes of upper test segment. It is provided with a gear system to lift the upward direction. Pre-calibrated proving ring of 5 tones capacity is fixed on the upper end of the machine, specimen contained in the test head is placed in between the base and the proving ring. The load jack produces a uniform vertical moment of 5 cm per minute. Machine is capable of reversing its moment downward also. This facilitates adequate space for placing test head system after one specimen has been tested. Flow meter consists of guide, sieve and gauge. The activating pin of the gauge slides inside the guide sleeve with a slight amount of frictional resistance. Least count of 0.025 mm is adequate. The flow value refers to the total vertical upward movement from the initial position at zero loads to value at maximum load. The dial gauge of the flow meter should be able to measure accurately the total vertical moment upward. Thermometers of range up to 200 °C with sensitivity of 2.5 °C and Miscellaneous equipment like containers, mixing and handling tools etc. 1200 grams of aggregate blended in the desired proportions is measured and heated in the oven to the mixing temperature. Bitumen is added at the mixing temperature to produce viscosity of 170 ± centi-stokes at various percentages. The materials are mixed in a heated pan with heated mixing tools. The mixture is returned to the oven and reheated to the compacting temperature (to produce viscosity of 280±30 centi-stokes). The mixture is then placed in a heated Marshall mould with a collar and base and the mixture is spaded around the sides of the mould. A filter paper is placed under the sample and on top of the sample. The mould is placed in the Marshall Compaction pedestal. The material is compacted with 50 blows of the hammer (or as specified), and the sample is inverted and compacted in the the other face with same number of blows. After compaction, the mold is inverted. With collar on the bottom, the base is removed and the sample is extracted by pushing it out the extractor. The sample is allowed to stand for the few hours to cool. 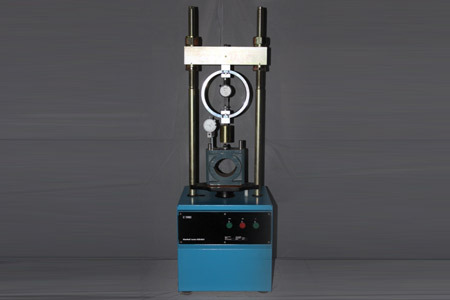 The mass of the sample in air and when submerged is used to measure the density of specimen, so as to allow, calculation of the void properties. Specimens are heated to 60 ± 1 °C either in a water bath for 30 - 40 minutes or in an oven for minimum of 2 hours. The specimens are removed from the water bath or oven and place in lower segment of the breaking head. The upper segment of the breaking head of the specimen is placed in position and the complete assembly is placed in position on the testing machine. The flow meter is placed over one of the post and is adjusted to read zero. Load is applied at a rate of 50 mm per minute until the maximum load reading is obtained. The maximum load reading in Newton is observed. At the same instant the flow as recorded on the flow meter in units of mm was also noted.